Does any 1 have any photos to upload or any links or anything regarding that very show in DECEMEBER 2002?? WOUld love to see afew photos or anything. Also has any 1 ever seen a boot of INSIDE US ALL - live?? Tell me how to post photos here. I have a couple. Now, here's a thread about the Chicago show I finally like! You will have to upload them at Photobucket, or even YouSendIt, if you like. Then post the link here. I dunno why the [img] code is disabled over here, but I think Steve is your man on that subject! I have seen one photo. 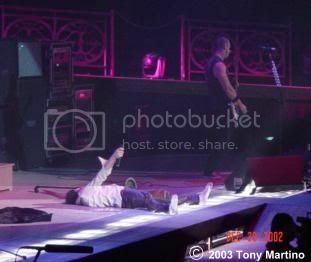 I remember doing a yahoo search and some guy had one picture up, of stapp lying on his back with his socks hanging partly off his feet. He looked bad. Yeah, okay... Too bad though, I like to have one of my banners as my siggy. Lith, pm me your addy and I'll email them to you. Hey can I please see them aswell, just post a link up for every1 if u can , thanks. Hey steve, yeh i know u did, thanks for that, but now Im after A VIDEO performance of inside us all live not audio, lol sounding greedy now, but I dont think that song was ever taped live live..? Ryan, you've never seen them??? Do I have your addy? I'll get them to you. Here are the links.... hope they work.